igoo have launched the e-commerce website for Jumbo Bean Bags, the ridiculously large and comfy furniture for the home and garden. The CMYK bean bag range is the first in a line of stylish and colourful releases from the company. The CMYK range is built around the 4 colour printing process with each bag being matched identical to their counterpart on the colour scale. Cyan, Magenta, Yellow and Black, they’re all the same size and are big enough to sleep on or even better just to lounge on. We’ve just placed an order so should have two bags in the office on Monday! 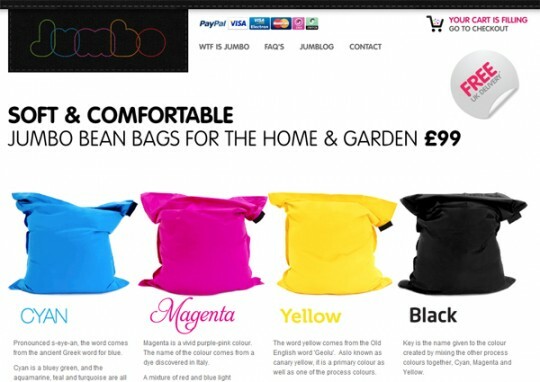 For free 48 hour delivery check out jumbo bean bags.